The Apar Segong village is at one of the junction at the Batu Kawa - Singai Bau road. In the village, there is a project run by REDEEMS. Association of Research and Development Movement of Singai Sarawak (REDEEMS) is a community based organization (CBO) for the 12 Kampungs (villages) in Singai area of Bau District in Kuching Division of Sarawak, Malaysia. The 12 kampungs are namely Kpg. Apar, Kpg Segong, Kpg. Barieng, Kpg. Sudoh, Kpg. Atas, Kpg. Tanjong Poting, Kpg. Tanjong Bowang, Kpg. Senibong, Kpg. Daun, Kpg. Bobak Sajong, Kpg. Bobak Sejinjang, and Kpg. Sagah. These kampungs are predominantly inhabited by the Bisingai tribe of the Bidayuh community with an estimated population of not less than 15,000 people. I visited the Bamboo Park, this park is officially launch by Alfred Jabu Anak Numpang (the Deputy Chief Minister of Sarawak) on 30 Oct 2007. Just right beside the park, the team also build a huge Bidayuh traditional house, its very obvious that they want to turn this place into a tourist destination. The project is still ongoing. For the park, a lot of different spices of bamboo can be found here. Which some are quite pretty. The place are shaded with tress and bamboo, and windy breeze most of the time. A good place to do jungle trekking. 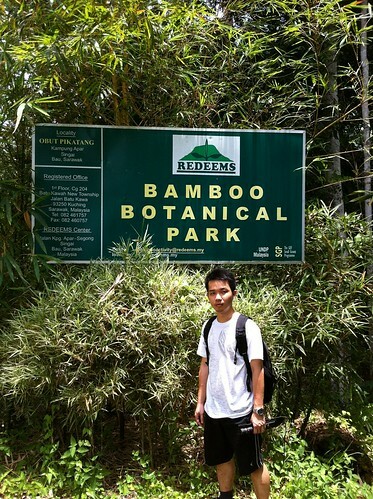 And to learn different types of bamboo, a good place to go for the weekend. The problem is deforest project is getting serious each and everyday, whenever I've been to a place, I will ask the people there about the habitat surround it, and I always get the same answer. "Tress been cut down, animal been shoot dead" And this may one day be the end of our beautiful rainforest. Please help to preserve our forest.